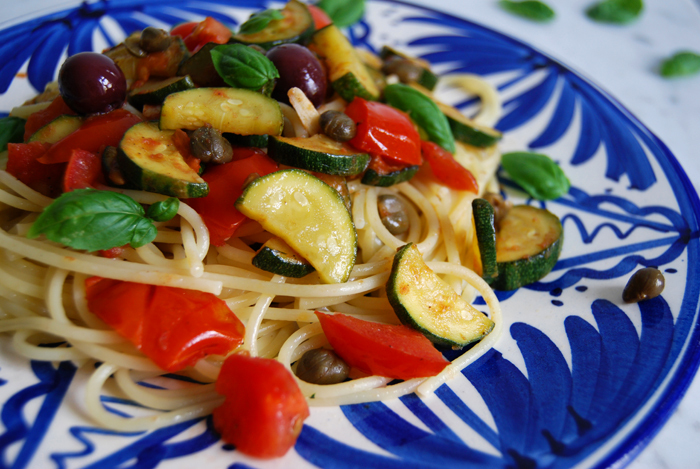 The beginning of July is the perfect time to throw a few of my favourite vegetables on a big plate of spaghetti. 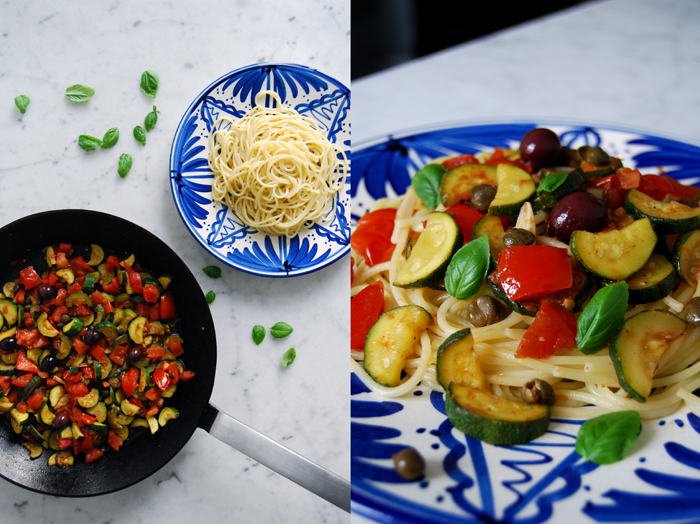 This dish is basically a Mediterranean Caponata, just without aubergine as it would have stretched the cooking time and changed the texture – I didn’t want a juicy sauce, I was after some crunchiness! 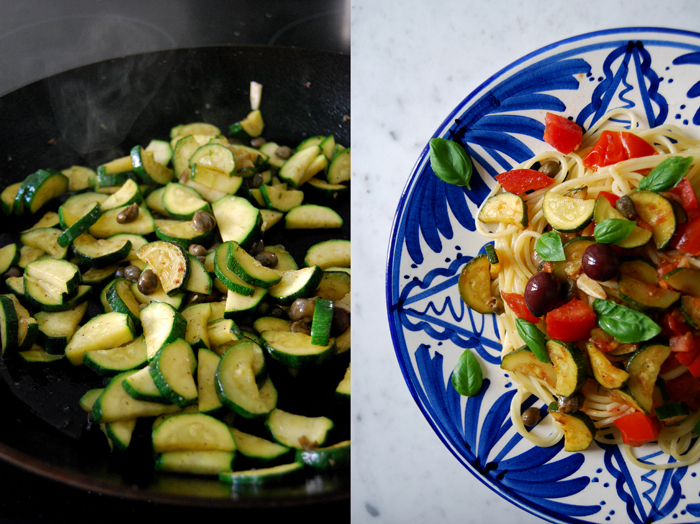 I mixed lots of zucchini with my Gozitan capers, anchovies and garlic and sautéed everything for a very short time. This way, the vegetables stay firm and fresh like a salad. 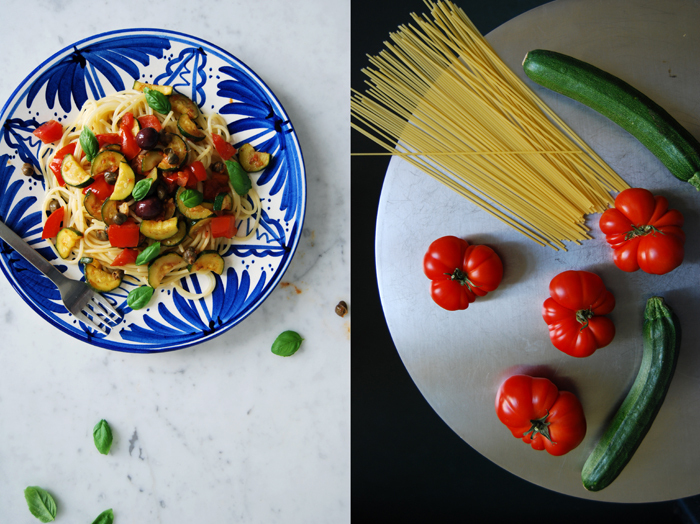 My tomatoes, olives and basil weren’t even cooked, I just mixed them together with some olive oil into the warm pasta. 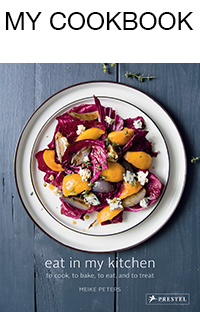 When vegetables reach the peak of their season they don’t need long to spread their aroma. Spoiled by the sun, strong in flavour and full of vitamins, they have this intense taste of summer that I’ve been waiting for for months. A few minutes in the hot pan and they were done, that’s one of summer’s kitchen qualities! In a large heavy pan, heat a splash of olive oil, add the anchovies, garlic and capers and cook for 1 minute on a medium heat. Add the zucchini and a little more oil and cook for 5 minutes on high-medium temperature, stirring every now and then. Season with pepper (no salt!) and mix into the spaghetti, add a tiny bit of olive oil if the pasta is too dry. 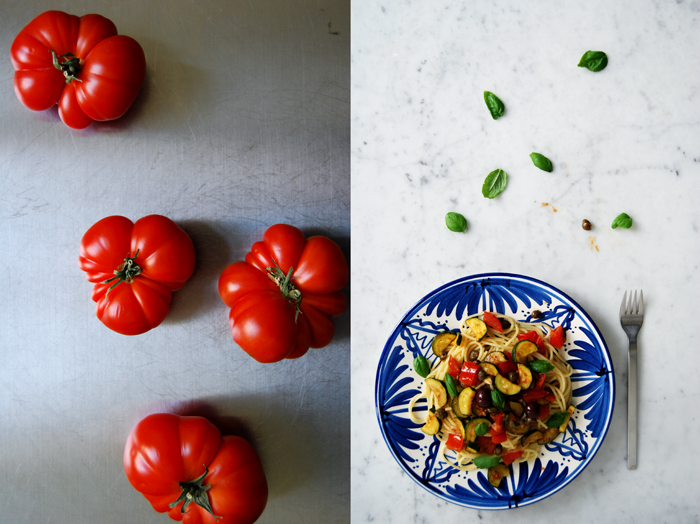 Stir in the tomatoes, olives, basil and mint and serve immediately. There should be enough saltiness from the anchovies and capers, I didn’t need to add anymore.